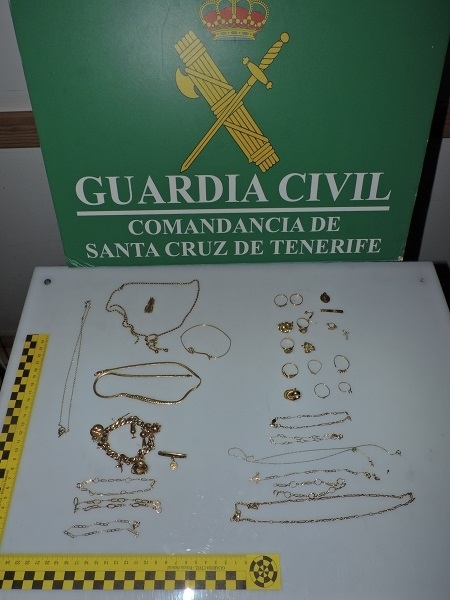 The Guardia Civil have arrested a 57-year-old man and a 67-year-old woman from La Orotava who supposedly broke into a graphic shop in the same town. The suspects, who already have previous convictions, forced the door open and then entered the shop where they broke into a safe and stole the owner's family jewellery. In total, the stolen goods were valued at around €2,900. 14.09.2018 - Some of the stolen items were recovered from a shop that buys gold, where the man had sold some of the jewellery. Further investigations in the vicinity of the suspects revealed that a woman had also sold part of the jewellery. All the stolen pieces were recovered by the police and returned to the rightful owner.